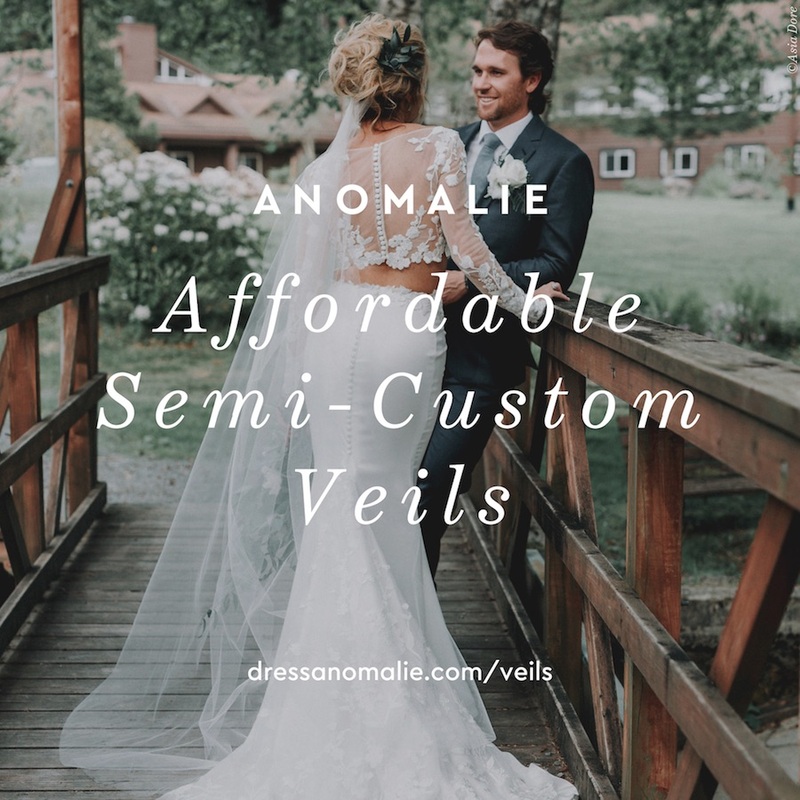 SAN FRANCISCO, Dec. 6, 2018 /PRNewswire/ -- Anomalie, the fastest-growing direct-to-consumer custom wedding dress company, is excited to announce the launch of their new semi-custom veil product line. Set to launch on Dec. 10, 2018, Anomalie is now offering over 30 different veil styles available in their online store. The online custom wedding dress company is taking the wedding dress shopping experience to the next level for the modern bride by expanding their offering to semi-custom veils that can be ordered in just minutes. This collection comes at a time of change for the wedding dress industry. The first and second largest retailers (David's Bridal and Alfred Angelo) have filed for bankruptcy in the last two years; J. Crew and Gap have also exited the industry. "Here at Anomalie, we value what the modern-day bride is interested in, which is affordability and customization. Through a new process, we are able to provide our customers exactly what they are wanting in terms of their veil needs at an unbeatable price through our new veil collection," said Leslie Voorhees, CEO of Anomalie. The one-of-a-kind veils begin at $50 for a veil that would normally retail for $300-$2,000. Anomalie is able to offer such value to the new designs by working directly with the same workshops that produce dresses for high-end designers such as Pronovias. With such partnerships, the brand is able to sell directly to the brides from the suppliers, creating a competitive advantage within the bridal industry. Anomalie veils are available through an easy online ordering process, with or without a wedding dress, at dressanomalie.com/veils. Within the veil collection, Anomalie gives brides the choice between different trims, lengths and styles to fit any bride's wedding-day style. "Anomalie is bringing transparency and sane prices to the veil market. By doing so, we are able to provide the smart budget-savvy bride with customization without the designer markups," said Trish Lee, Anomalie's chief design officer. Utilizing their resources and abilities to provide luxury veils at a fraction of the cost of their competitors, Anomalie is slashing boutique overhead and designer markups to deliver handcrafted veils via a smarter route. This launch comes two years after the company was founded to help brides create the dress of their dreams without breaking the bank. Leslie Voorhees, co-founder and CEO of Anomalie, wanted to partner with workshops as she quickly realized that brides were limited to wedding dresses sold in brick-and-mortar stores. By selling direct to brides, Anomalie is able to offer a much better price and almost unlimited customization. Vox recently noted that "brides are ... becoming more averse to traditional bridal gown price tags" and the "trend toward customization has led to the advent of ... bespoke wedding dress online retailers like Anomalie." The veil collection offers six unique trim options: Tulle Have and To Hold, which is a classic tulle veil with a raw cut edge; Oopsie Daisy includes modern and bold florals with a scalloped edge (inspired by Meghan Markle's royal wedding); Vintage Vines incorporates guipure cotton lace for a more boho look; the Royal Treatment showcases a wider chantilly trim; Simply Scalloped is a scalloped lace overlaid with a delicate floral pattern; and Hint of Sparkle showcases a glittery combo of hand-sewn sequins, pearls and beads. Catering to the wants and needs of all of their brides, Anomalie's new veil collection comes with veil length options of fingertip, court and cathedral. Each style is also available in single or double tiers, the second tier providing a cascading effect in the back or can be pulled over the face to create a blusher. Anomalie is the fastest-growing direct-to-consumer custom wedding dress company. Their mission is to bring more value to the wedding dress shopping experience for any body type and wedding style at an affordable price point, starting at $1,000. Anomalie arrived on the wedding scene in 2016 and within in the last year, eight percent of U.S. brides have contacted Anomalie about creating a wedding dress. Anomalie caters to the "Smart Savvy Bride" who can't find the perfect dress. The company was founded by Leslie Voorhees and Calley Means, two Harvard Business School classmates. While in the midst of planning their own wedding, Leslie became disheartened with the entire wedding dress shopping experience from the lack of options to the insane designer markups, she knew there had to be a better solution. When she couldn't find one, she created her own and Anomalie was born. With a team consisting of former executives from David's Bridal, Vera Wang, Stitch Fix, Airbnb, Google and Apple, Anomalie's new line has been funded by the early backers of Warby Parker, Stitch Fix, Allbirds and Glossier.